So last week I bought these in Walmart for about $9.99 each. Honestly, I think that’s more than a little excessively-priced for a semi-permanent, but L’Oreal and Walmart seem to think differently. I got three colors, but first I tried teal and indigo in a sort of ombre. They applied easily, didn’t smell funny, and I liked that the packs came with lots of gloves and a brush for precision. The purple worked a lot stronger on my highlights than on the rest of my hair. I wasn’t in love with that, to be fair. It seemed a bit dull and toned down. I think my hair needed to be lighter than the darkest picture on the box, whereas my hair was exactly that same color of medium blonde. The teal took to my hair easily and the color was vibrant and didn’t look flat or dead like a lot of green dyes do. I liked the result and would use it again. I also liked the fact neither color ran and they didn’t stain the bathroom or my towels. As you can see, it’s tricky to tell whether it’s completely covered or not. The dye that went on my skin took about 24 hours to come off, btw. The teal was a shiny color that left my hair looking happy, where the purple made my hair look a bit lifeless and dull. Honestly, when my hair dried, the indigo reminded me of this purple hair mascara I had when I was a 13-year-old in the ’90s. I also felt like the purple came out much more patchy than the teal, as seen above. The next day it settled better, but the purple still seemed patchy despite the fact I’d covered all those brown bits in purple dye. I have never had a dye do this to me before and I applied this with a brush so I’m not sure what else I could do. Overall, I think I liked the green a lot more than the purple, which says that your experience of L’Oreal Colorista will completely depend on what color you get. It’s also worth noting that, despite the claims that this lasts 4-8 washes on the purple and 8-16 washes on the teal, they both looked a little less vibrant after 2 washes, and by wash 5 or 6 I doubt the purple would still be visible. You would probably want to reapply this at least once a week, possibly twice, to get a color buildup that lasts a bit longer than a couple of washes. You can get the teal here on Amazon currently for just over $8, but I’m not linking to the indigo because it wasn’t great so I can’t recommend that anyone buys it. I’ve also got one of the red ones to try so I’ll maybe write about that at some point soon, too. This is a Haul and First Impressions video of my MAC, L’Oreal and Collection make-up shopping trip last week, with some exciting new cosmetics including the MAC pro-longwear concealer and the Collection highlighter. I did upload this last night but decided to take it down, re-do a couple of the swatches, then put it back up again, so it’s just gone live on Youtube! I’d love if you right-clicked and watched it over there so it counted towards my stats (they don’t count embedded views on the Youtube stat counter, WTF), but more than that, I’d love if you watched it! Author MsAdventurePosted on March 23, 2016 March 23, 2016 Categories beautyTags beauty, beauty blogger, Collection, concealer, cosmetics, L'Oreal, MAC, make-up, makeup, pro-longwear, product, products, swatches, vlog, youtube3 Comments on Haul! + First Impressions! This is the updated version of one of my most popular articles, I have had to re-write it due to Amazon Associates axing my account, and thought I’d add in the shampoos I’ve tried since I first wrote this article. 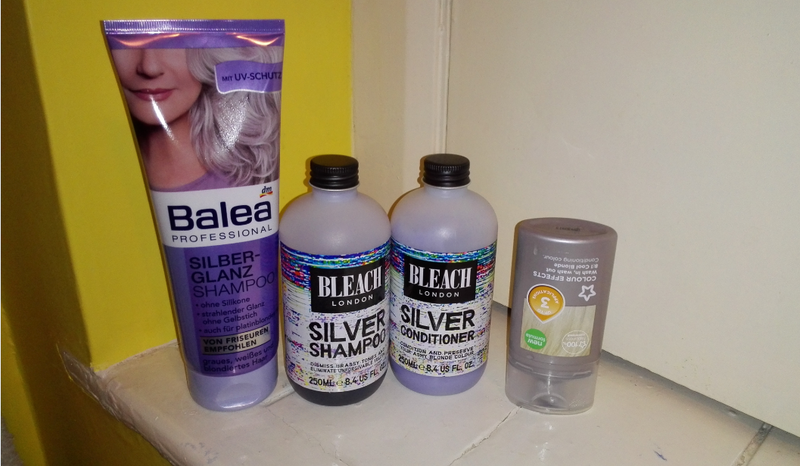 A rounded up photo of all the silver shampoos from my original article. The pro-voke one isn’t pictured because it was so bad that I haven’t bought it since the last lot ran out. A hairdresser who I know, who shall remain anonymous, believes that all silver shampoos are created equal. I have also seen conflicting advice on the internet about how, exactly, you’re supposed to use silver shampoo, with some people seeming to think it is used to tone the hair. See this article on toning to find out about my toning routine. 1. You bleach your hair. I would use a powder bleach and developer combo, such as John Frieda B Blonde High Lift Powder Bleach (or L’Oreal Quick Blue in the US) and bottles of peroxide (see my other hair articles to learn more about bleaching and what products I’ve used, and why I use the ones that I do), although I have had success with box dyes in the past. 2. You wash all the bleach out. 3. You tone your hair with a toner. These work like either semi-permanent colours (directions silver toner or directions white toner, any of the toner mousses, Jerome Russell Platinum Blonde Toner, Manic Panic Virgin Snow) or permanent colours (Bleach London White Toner; Wella Color Charm T18 White Lady). Basically, if your toner requires a developer, it’s not semi permanent. 4. About a week after you toned your hair, start using silver shampoo and/or conditioner as a maintenance to prolong your toning. Use it once or twice a week, depending on how frequently you wash your hair. 5. If you wanted platinum blonde, and your hair is getting too silvery, use the silver shampoo less. The Superdrug one is a-maze. It only comes in a tiny travel size bottle so if you’re going on holiday, I think you could get it through carry-on security without any issues, although check before you go as I drive to my exotic holiday destinations because I loooove road trips. This Superdrug one came with me to Rome the first time I went, in 2006, and I am convinced it protected my hair from the sun. One of the things I love about **being a light blonde abroad** is that your hair reflects the sun’s heat and you get less hot. The Superdrug shampoo is the cheapest to buy but not the cheapest per-100ml, because the bottle is tiny. It says up to 3 applications but my hair is waist length and super thick, and I get 2 applications out at the very most, so I’d say if your hair is shoulder length you’ll get more than 3 applications out of this. Pro’s: The colour is very grey, and covers a multitude of sins including uneven toning and bleaching, accidental use of argan oil, and smoking. When I was pure white in 2008, I used this shampoo to get rid of nicotine stains from my housemates’ 40 a day habit. It’s good for airport carry on – the bottle is tiny. It’s easy to use, and you can leave it on for up to 15 minutes for a stronger colour result (it doesn’t say that on the packaging any more but it still works). 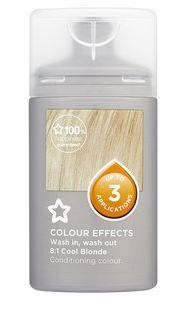 Con’s: The colour is a very DULL grey, I don’t like the lack of sparkle to my hair after using this too frequently. The colour builds up very quickly, meaning your hair colour keeps changing. I find this annoying. The bottle is tiny, and at the price, it gets expensive if it’s your regular use one. Conclusion: Take this one on holiday (in its own sandwich bag – if this leaks, you got a purple MESS), don’t use regularly at home, but can correct toning errors as long as you use another silver shampoo regularly. I found this in Austria, where it was E1.65 for 200ml, I bought one for the rest of my journey. Then I found it in Germany, on the way home from Italy, where it was E1.45 for the exact same bottle, so I bought 6 to bring home for personal use. Recently, I found out Balea are selling to the UK on Amazon. I like this as a maintenance silver shampoo. Pro’s: The UV filter protects your colour (no I don’t know how that works, but I tested in August in Rome; no colour shift at all and minimal drying to hair). It comes in a very reasonable bottle size, unlike Pro:Voke or Superdrug. It has a gentle effect so it never builds up. Con’s: It has a gentle effect, so if you need something stronger you might want a different product. 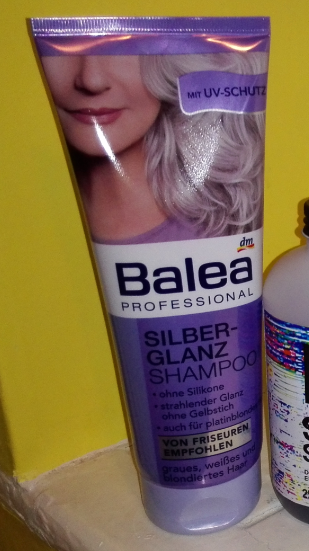 You can only buy it cheaply in Germany, or slightly more expensively in the rest of mainland EU; the prices on Amazon Marketplace UK are shocking, I’ve seen Balea shampoo go for over £4 which I wouldn’t mind but it’s E1.45 in Germany! Stock is also limited on Amazon, to the point that it’s currently sold out. Conclusion: I really love this shampoo, but it’s hard to get hold of and doesn’t deposit much colour, so I might be in a minority. You’ve got to hand it to the Germans; they really know how to take care of Ag and Pt hair for cheap. I’m looking forward to seeing if Sweden has similar exciting products if I ever get to go! This is a really confusing one to review because they actually do two different shampoos and two different conditioners – they do tiny, more expensive bottles which are supposed to be the stronger stuff, known as Touch Of Silver Twice A Week Brightening Shampoo 150 ml for less regular use, and they do the cheaper, larger bottles called Touch Of Silver Daily Shampoo. I’ve finished an entire bottle of each of the four products – two shampoos, two conditioners – and am finally ready to comment. Pro’s: They’re relatively cheap and readily available. The tiny bottle of twice-weekly shampoo makes a bit of difference to your hair. Con’s: The regular use shampoo and both conditioners are less than useless. I get a much better result from using a better silver shampoo and a decent non-blonde conditioner made for normal people’s hair. Both conditioners left my hair dull and dry, despite claiming to contain optical brighteners. The tiny weekly shampoo didn’t make that much difference to my hair, even after 20 minutes, and the result was always uneven, no matter how long or short I left it on for. Personally I am not going to buy this range again, and I suspect they’re only so popular because people don’t know what other silver shampoos are out there. Conclusion: These are for sale everywhere and if I totally ran out of every other silver shampoo and this was the only thing for sale, I would buy the weekly use shampoo. If I had absolutely no other choice, I still wouldn’t buy the regular shampoo or either conditioner again they have done more harm than good and my hair looked less silver after using them. 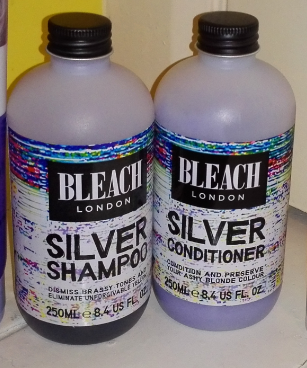 Bleach London’s silver shampoo and conditioner. These are so good they should be for sale in every shop. Even bakeries. As far as I know, this is a relatively new product. Since I first saw it’s empty shelf with a price tag in Boots, it’s been sold out every time I’ve been in, for a few months, but I finally ran out of the Pro:Voke last week so could buy this guilt-free and it was FINALLY in stock. I got the shampoo and conditioner, but I haven’t tried the conditioner yet, and here’s why: The shampoo is enough. Literally, it leaves my hair more silver, but doesn’t dull it or leave a nasty residue, the colour result is even and smooth, and I’ve washed it again with non-silver shampoo since I first used it, and this silver shampoo hasn’t faded at all. Pro’s: See above. Plus you don’t seem to need as much product to cover your hair as any of the others I’ve tried. Update June 2015: I have used a full bottle of the conditioner now, and feel it’s nowhere near as good as the shampoo, and it’s not very conditioning either. Con’s: It’s the most expensive out of all the ones available in normal shops, at £5 a bottle (as of 2015), but it’s worth it, and I know that bottle will last because I don’t have to use it every time I wash my hair, or even every two times. I could finally wait ten days between silver applications! You do get product build up with this one though, which dulls the colour of your hair, and it’s quite harsh on the hair, and very drying. I team it with Schwarzkopf Gliss Liquid Silk Gloss Conditioner to get more sparkle from my hair strands. The silver conditioner is definitely good for extra cool tones. Conclusion: It’s good on the colour side if you want dark silver, it’s less good for white or platinum. I would buy it again but only if I couldn’t afford either the L’Oreal Professional silver or Tigi Catwalk Violet shampoos. I bought it from a professional hairdressing store, they generally sell to the general public these days; otherwise it’s available online at the well known shopping giant Amazon. I found the lid was quite flimsy so I wouldn’t order it online unless my local professional stockists stop selling it. Pro’s: I absolutely love this one. It’s the most even coverage, gives the best silver result, doesn’t dull down the colour of your hair, and offers the least product build up. It’s nowhere near as abrasive on the hair as the Bleach London one. It’s about £7.50, making it the most expensive gram-for-gram, but it’s the best one there is, and of the six I’ve tried, this is the one I’ll be buying again, once my Tigi runs out. It also has a more blue base than the others, so it brings the hair to a whiter silver than the Bleach London or the Superdrug ones. Con’s: It’s lid is really flimsy which means that I wouldn’t trust a mail order company. Also it’s hard to acquire if you don’t live in a city with a professional hairdressing store. Conclusion: I love this shampoo and once I’ve finished the Tigi one, this is what I’m going to buy again. Again, it’s available either from professional/specialist hair stores, or you can get it online. Pro’s: It was £17.50 for about a litre and a half of this stuff. So it’s the cheapest per gram of any of them. It leaves your hair really soft and nourished, and is the least abrasive of any of the most pigmented ones. It has a pump top so in the shower you can just press down on it to get the product out of the bottle. Con’s: It’s in a really big bottle, so if you don’t like it, you’re stuck with it for ages. Its coverage isn’t quite as even or as pigmented as the L’Oreal one, and it really works best on towel dried hair rather than wet hair in the shower. Conclusion: I like this shampoo, and I’m about 2/3 of the way through the bottle now, but I don’t think it’s quite as good as the L’Oreal one, so I’ll be using the L’Oreal one once this bottle is finished. So there you have it, my favourite is L’Oreal Professional’s Silver Shampoo. Obviously this is my subjective opinion based on results I have observed on my own hair, so I don’t want to urge you to rush out and buy it, but personally, I’m so glad I did. Also, it’s not good for your hair to use a silver shampoo every time you wash. With the exception of the Balea one, none of the others actually clean your hair much, they just fix the colour. Only if I’ve used dry shampoo on my hair, I would shampoo with a non-silver before using a silver shampoo just to clean my hair so it’s ready to take on the colour. I do this because when I was a brunette last year, I had the brown dry shampoo, and two wet shampoos later, I’d still be getting brown residue of dry shampoo washing out of my hair. At the end of the day, dry shampoo is still a product and it still builds up in your hair, it’s not a real shampoo, it’s actually powder that absorbs grease, and it needs to be washed out before you use silver shampoo otherwise your colour result will be disappointing because it’ll stick to the dry shampoo residue and wash straight out. 28-03-15 For a review of what I’ve used between silver shampoos, I’ve written a separate article which is now published! I’ll add my white hair tutorial once it’s uploaded on Youtube.